Growing up, I have almost always owned a cat and I secretly wanted a dog. 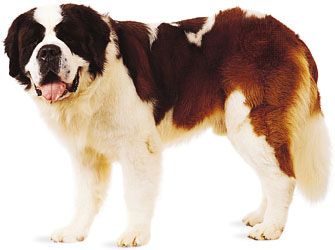 When I moved to Oklahoma, I found myself scared to death of a St. Bernard that wanted to lick the very features off of my face while standing on his hind legs. This huge beast was easily taller than my petite 5-foot, 3-inch stature so I was immediately intimidated. Back in New York, I hadn’t known many people with big dogs. I had thought I really liked dogs until I met this one. Later on, apart from living with the dog and three cats, I was bestowed another cat. This one was mine. My cat, Katy, absolutely abhors Saint. She spits and hisses at him, which is almost comical in that he is 10 times her size. All he wants to do is help her groom. Maybe she won’t get so many hair balls. If anyone has ever seen the movie “Beethoven,” I believe it is almost accurate in describing our St. Bernard. He’s huge, eats just about anything he can reach, and insists he is indeed a lap dog. He can make anyone smile with his adorable half-masked face and he never tires of being there to please. All this aside, when I first met Saint, I had no intentions of ever entering the house. Now that I’ve gotten used to him, I can almost lay on him (although he doesn’t like it much). St. Bernards are adorable as puppies with their big paws and small torso. They are even cuter with the half mask. However, they aren’t puppies for long. For anyone who is looking for a furry member to join the family, consider a St. Bernard. Nicknamed the nanny dog (as they are gentle with children), lover of snow, people and attention, these dogs might just be your type. Keep in mind, these dogs drool, grow fast, require space to grow and prefer the cold so don’t keep them in the heat for too long. As much as I like Saint, however, I’m still a cat person. Sorry, buddy.